Pastorious settled Germantown in 1683. The first mill was built on the creek in 1695 an Robeson’s mill was built at the mouth of the creek in 1686. Rittenhouse built his mill in 1700. Thomas Shomaker built the mill, known as “the great mill”, in 1717. It was the largest in the colonies. Ruins of this mill are behind Glen Fern. The date stone from the mill was visible in the ruins. The mill and adjacent property were sold to Thomas Livezey on October 10, 1747. The mill was destroyed in a fire on October 24, 1793. After the burning of the great mill, Robert Wharton built a new one. By this time there were 24 mills along the creek, making this the industrial center of the colonies. By 1850 the number of mills had grown to 60 and the Valley Green Inn was built. The first section of Glen Fern was built in 1696. A later section of two and a half stories were added in about 1732 and the final back two stories with large attic some years later. The Fairmount Park Commission bought the Livezey Estate in 1869 and “Old Glen Fern” became public property. The Valley Green Canoe Club was founded on September 10, 1909 and was chartered on April 2, 1914. 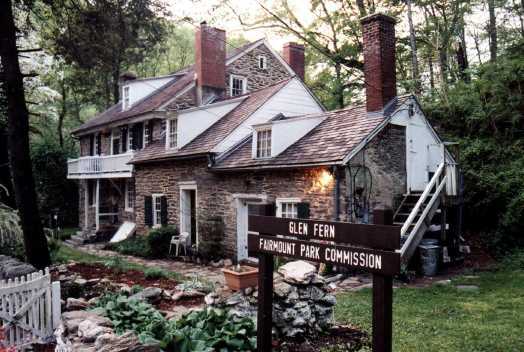 The use of Glen Fern was granted to the Valley Green Canoe Club by the Fairmount Park commission on September 10, 1909.